The most beautiful qualities and also the biggest quantities of green aventurine quartz come from India, mainly from the states of Karnataka and Tamil Nadu. A rather particular blue variety, on which the colour is caused by inclusions of dumortierite, is sporadically mined not far from Jaipur, capital of Rajasthan state. China possesses some mines but generally their green colours from this provenance are rather clear. Since a very long time, small quantities were found in Tibet. Russia with its mines in Ural produces important quantities of red-brown aventurine. We also find it in Siberia in the mountainous region of Altai as well as in Karelia near the Finnish border. Aventurine quartz is also found almost everywhere in Europe, particularly for the brown varieties in Spain, on the beach of Cabo de Gata in the natural reserve near Almería. In France, it is found with the same tint near Vallet in the Nantes region. Deposits are also in Austria in the Styria region, near the city of Mariazell. Aventurine quartz is also found in Germany, Finland and Scotland. After India, the second world producer of aventurine is Brazil. In the same continent, Chile also produces some specimens of orange red colour. In this country, mines are generally located near copper deposits. 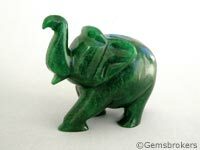 Africa also produces aventurine with mines located in Tanzania and Zimbabwe.